Designed by Selgascano & project managed by Second Home, this rooftop project primarily features several ‘infinity ponds’. Aligned with the level of the work desk, these were originally located to create an illusion of working while sunken within a continuous pond of water. Final versions of the scheme involved fewer ponds but maintained a similar effect along the perimeter of the space. 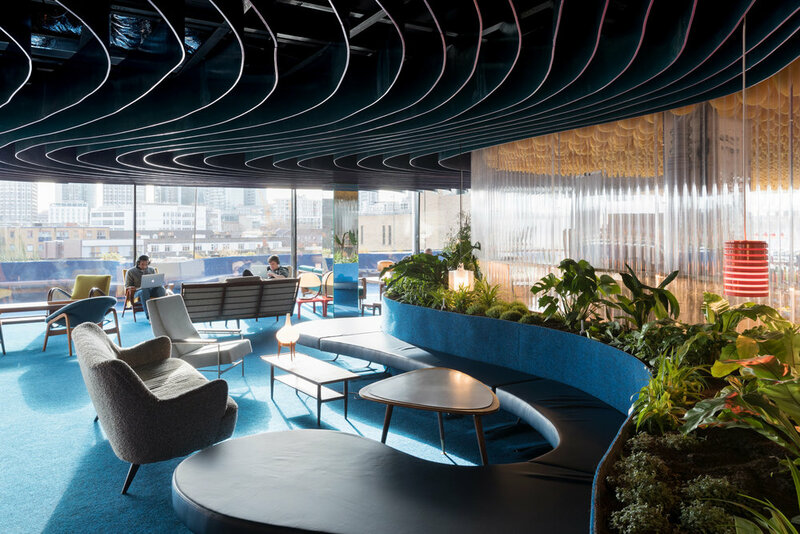 The space itself features terraces encircled by ponds and topped with an undulating fabric ceiling, framing rooftop views overlooking the City of London. The workspace layout developed over the course of the project—evolving from café-style lounge spaces to hot-desk 'roaming' to extra-large studios, reflect the changing needs of the market in real time. As co-working has become more commonplace, larger and larger companies have signed on. We learned that these larger teams have a completely different set of needs to their smaller counterparts. The latter iterations of the project—comprised almost entirely of 50-60 person studio spaces—hinted at the need for a fundamental rethinking of the co-working product as it related to companies of that size.